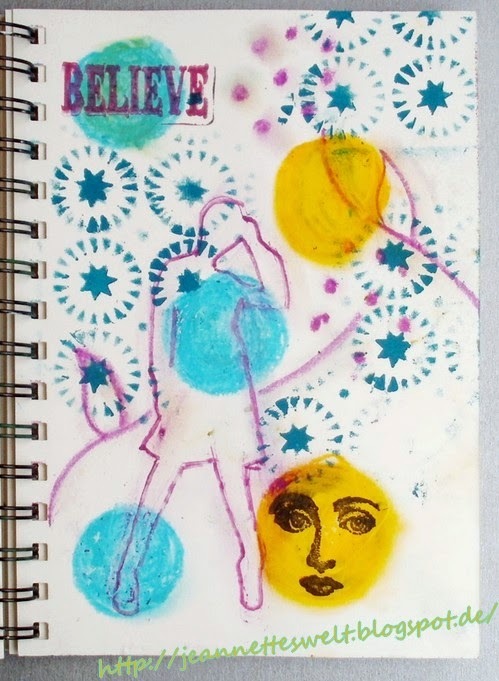 "Several years ago I discovered Art-Journaling for me - inspired by some Artist Trading Card Crafters in an internet-forum. In the meantime I experimented with many techniques and styles and found my own personal style by now. I enjoy working intuitively - like it colorful and bright and sometimes I am into mystical climes on my pages. Next to the Art Journaling I paint Mixed Media Canvases - I like to use many mediums as acrylic paints , inks, sprays, oilpastels and recently watercolors as well. I love to try out new things and like to take new ideas and inspiration from other artists." Vielen lieben Dank für all die erstaunlichen Beiträge zu unserem letzten Thema! Fabelhaft! Ich bin vor einigen Jahren durch ein ATC - Forum zum Artjournaling gekommen. Ich habe seitdem schon vieles ausprobiert und glaube, daß ich mittlerweile meinen eigenen Stil gefunden habe. Ich mache gerne Dinge aus dem Bauch heraus und rein intuitiv, ich liebe es farbenfroh und auch mag ich gern mystisch Angehauchtes. Nebenbei male ich gern Bilder, da bevorzuge ich wie beim Artjournaling den MixedMediaStyle, benutze gerne viele Medien wie Acrylfarben, Tinten, Sprays, Ölpastells und neuerdings auch Aquarellfarben. Ich liebe es immer Neues auszuprobieren und lasse mich gerne durch andere Künstler inspirieren. Ohh, thanks Jeannette for wonderful theme. We love to incorporate circles in our journals, don't we? I would be interested to create more than one journal page this month! Wonderful theme, and I love your page Jeanette! Great choice of theme, Jeannette! And your page is so stunning! Looking forward to joining in again this month. Oh, wow, Jeannette, thanks for a great theme and a lovely sample, we'll be seeing lots of circles this month, I'm sure. Thanks Susi for the Pinterest gallery, that's a super way of showing all the artwork and we can link over to the actual blog sites too which is good. Das ist eine wunderschöne Seite von Jenny. Tolles Thema hat sie sich ausgesucht. Jetzt hüpfe ich noch in die Gallery. Danke dafür. Ein wundervolles Thema mit so vielen Möglichkeiten! Herzlichen Dank liebe Jenny! Und ganz lieben Dank, dir liebe Susi für "Art-Journal-Journey"! Great theme and fantastic page, Jeannette. Thank you for the great theme Jeannette and your inspiration page is wonderful too! I like the retro feel of the Jeannette's page. This was the perfect theme for me to convey the energy in my latest trip. Blessings! I love this circles theme, thanks Jeanette, your piece is very stylish, I love it! Ein tolles Thema und die Beispielseite von Jeanette gefällt mir sehr gut. ich freu mich, dass euere challenge so einen zuspruch hat. ich bin jetzt nr 70 und dabei ist der monat noch nicht halb rum! auch das thema ist klasse, vielleicht schaffe ich ja noch einen eintrag. Great theme Jeannette, & a very popular one! I love your page, you have a great style! A super theme and a fabulous page.